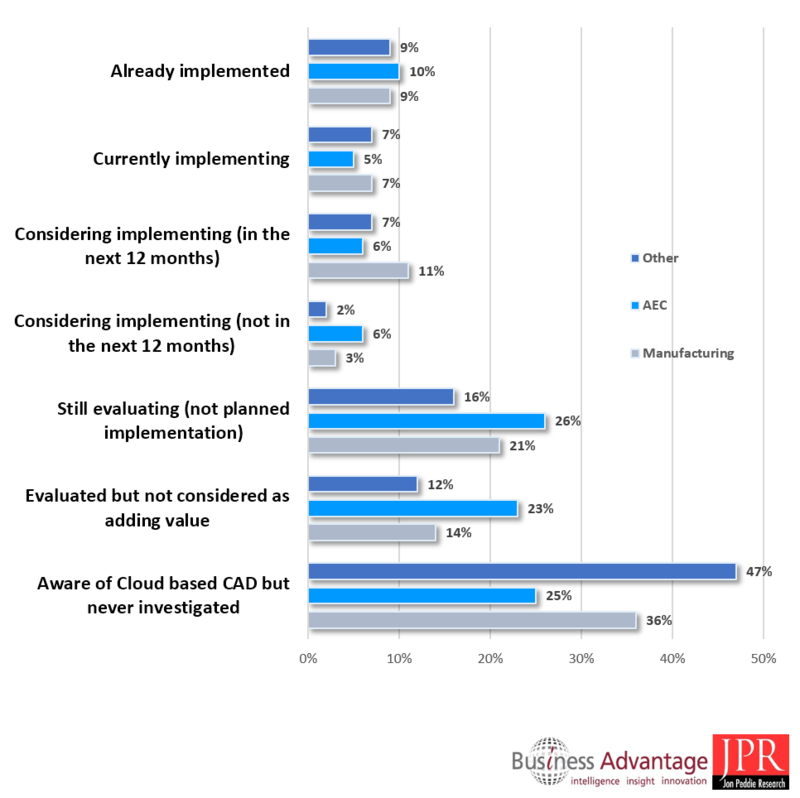 Jon Peddie Research (JPR) and Business Advantage Group (BA) today announced the availability of their co-created report on CAD in the Cloud (CiC) to present a 2017 view of trends in this market. The report is based on a custom designed survey, fielded worldwide, together with other insights and additional industry data. Content details of the report are available here. by industry, geography, company size, decision making authority and in some areas software usage. Figure 17 below shows how those implementing and planning to implement CiC, broken down by Manufactuirg, AEC and Other sectors, are pretty evenly distributed, with the manufacturing vertical coming out slightly ahead. Similarly there are differences by geography. Current usage and consideration is similar across regions, but APAC is significantly more likely than EMEA or Americas to be currently in a phase of implementation. In general, EMEA seems more reluctant to evaluate CiC than North America or APAC. EMEA companies (44%) for example are most likely to have basic awareness of CiC with no further investigation or consideration having taken place compared to Americas 27% and APAC 24%.